Carmel will forever be treasured as one of our favourite vacations. Although too short for our liking, we will most likely return as it’s so close to where we live. Excursions to Point Lobos, and the Carmel State Beach, to walks through the city of Carmel. It’s all so hard to capture into words, but instead it made memories in our minds, especially the restaurant I’m about to talk about with you today. 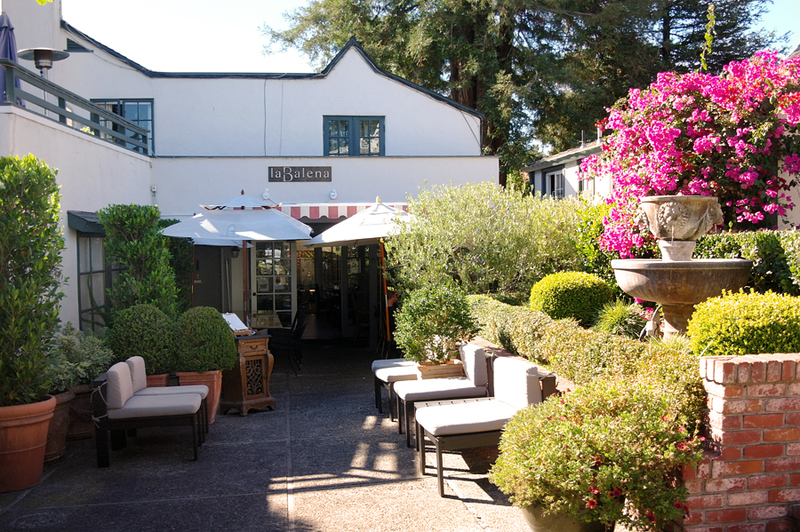 Anna and Emanuele Bartolini opened la Balena, one of Carmel-by-the-Sea’s newest and most première restaurants. We were invited to try a chef’s choice lunch platter on our last day in Carmel, and being the dog-friendly town we took Alfie in tow. 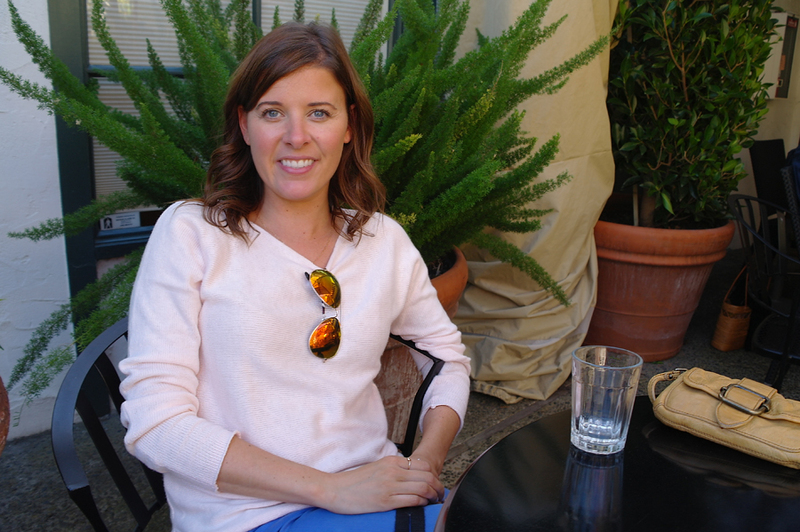 Our experience at la Balena was the best way to end our two day honeymoon. la Balena offers Italian comfort food in an upscale way. 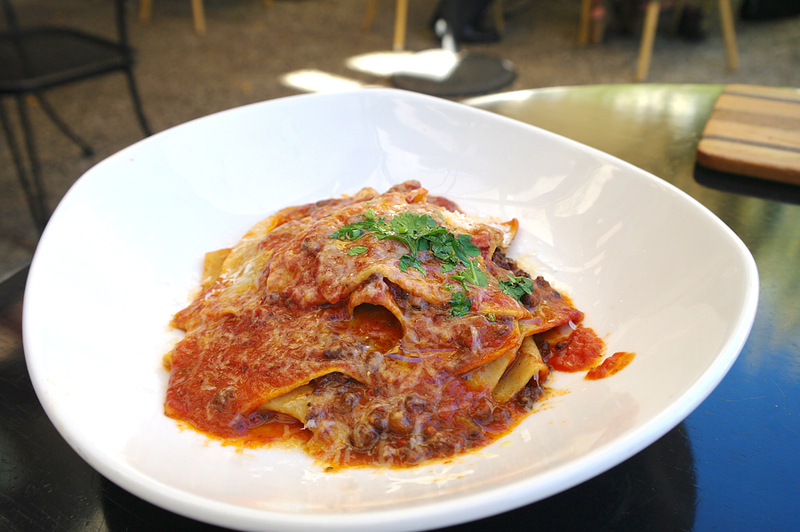 Have cravings for hand-crafted pasta or slow-cooked meat? Dine here for a highly curated selection of plates, and simply ingredients — yet exquisite flavours and tastes from your good ol’ hearty classics to something new. la Balena is not so uppity that you’re greeted with fancy white table clothes, but rather a laid back atmosphere where you can simply chill out for hours on end, catching up with loved ones on their beautiful patio out front, their modern seating inside with benches, or on the back, feeling as if you’re in someone’s back yard. Tucked away from the side walk on Junipero between 5th and 6th, a quiet Italian restaurant which serves both lunch and supper. However, you won’t find the same lunch menu twice. la Balena is a spot where I can return to for another amazing 2 hour meals with my husband, or family and friends. I applaud the restaurant for creating such a diverse selection of food to choose from. We had quite the fine dining experience at lunch on our last day in Carmel with the chef surprising us with dishes throughout our lunch. We sat outside since we had Alfie with us, but we overlooked a wonderful array of a beautiful fountain, shrubbery with gorgeous bright pink foliage with seating under the awning to sneak away from the sunshine. Seating inside the restaurant is comfortable and modern with a subdued entrance yet welcoming ambiance. The seating on the booths that lined the side wall looked comfortable. Towards the back, you could also sit in a garden nook at the base of a massive tree, and if you get chilly — there is a portable large stand-up heater. Emanuele greeted us and gave us a brief history of how he started out. Originally from Florence, he lived in New York City for a number of years, then recently he and his wife Anna moved to Carmel and opened la Balena two years ago. Emanuele mentioned to us that their kitchen at la Balena is purposely small with two small coolers, one for meat and one for vegetables. They are reliant on locating the freshest, most local and almost always organic ingredients from smaller farms around the area. The plates range in price from $6 to $21 for appetizers or lunch. I’m unaware of the prices on the supper menu. Upon sitting us at a table for two, out came some of the best bread I’ve ever had. I have a thing for good bread. We have been to two places in Carmel alone, that has fantastic bread. I could live off it if I could. It was served on a wooden platter with a small bowl of oil for dipping. The chef had surprised us with sampler dishes. Emanuele asked us if we had any food restrictions to which we replied onions. After he disappeared into the kitchen, we noticed that there was octopus on the menu. Having never eaten it before it was something we were a bit worrisome in receiving and not enjoying. The Guy whispered to me that if we did in fact receive the octopus to try, we must eat it. “Pretend you’re on an episode of Fear Factor, we mustn’t disappoint!” He definitely made me laugh with that statement, but nerves came over me as each dish came out, thankfully each plate could have pleased anyone and we were happy with everything. Two appetizers started us off, first being the Cavolfiore Fritto which had cauliflower, pine nuts, currants, chilli and bread crumbs. This was a standout dish for me. 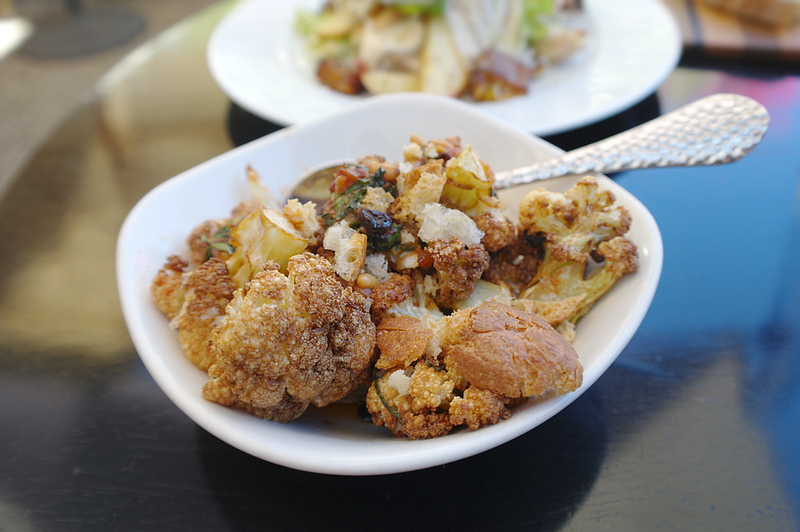 We eat a lot of cauliflower at home, but preparing it with the encrusted bread crumbs gave it a nice crunch, it really added something to the otherwise traditional side to a main course. With fun punches of colour this appetizer was served warm, which added to the fall festive feel to the dish. Though a little oily than I’d rather, I’d still order this one again in heartbeat. Along with the Cavolfiore Fritto came the Delicata which was a fresh zesty salad mixed with warm chicories, delicata squash, apple, pancetta, pecorino and mustard vinaigrette. It had a nice surprise of bacon. The primary meal we shared together was the lasagnette, a rustic bolognese besciamella and parmesan. It had hints of spice in the meat, yet the lasagnette was delicate and light. Once again we were served two platters upon finishing up the lasagnette. The Ali di Pollo is a rice crusted fogline farm chicken wings with anchovy aioli, something I was quite unfamiliar with, and a little hesitant to try. It wasn’t fish as I had imagined the aioli to be, but it was rather creamy garlic/tartar flavour to it. 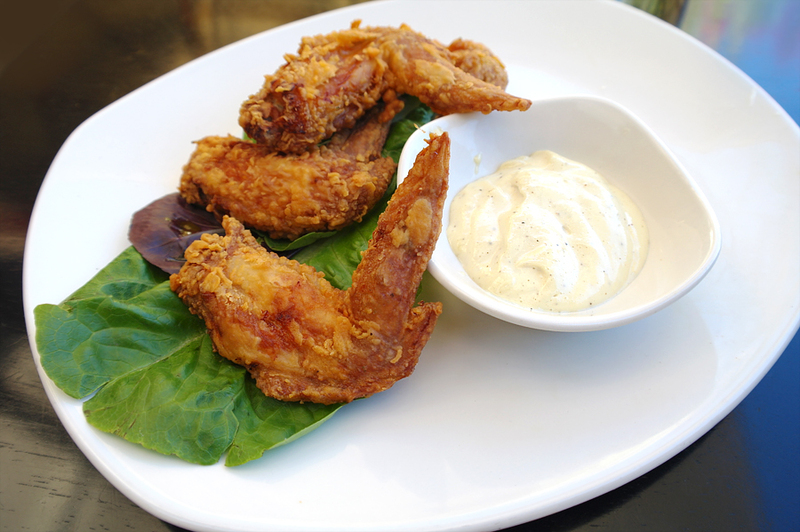 The chicken wings were light, flaky and pure fall off the bone goodness. 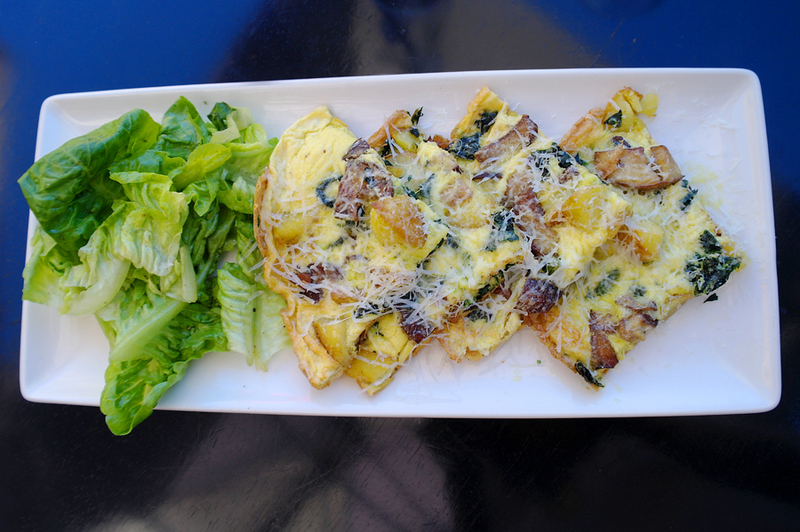 The Frittata with wild mushrooms, kale, potato and pcorino was The Guys favourite out of the 6 items we were served to try out. It was quite eggy for my liking, but that’s what you get for a frittata. On the other hand, The Guy described this one as his favourite dish of the lot. 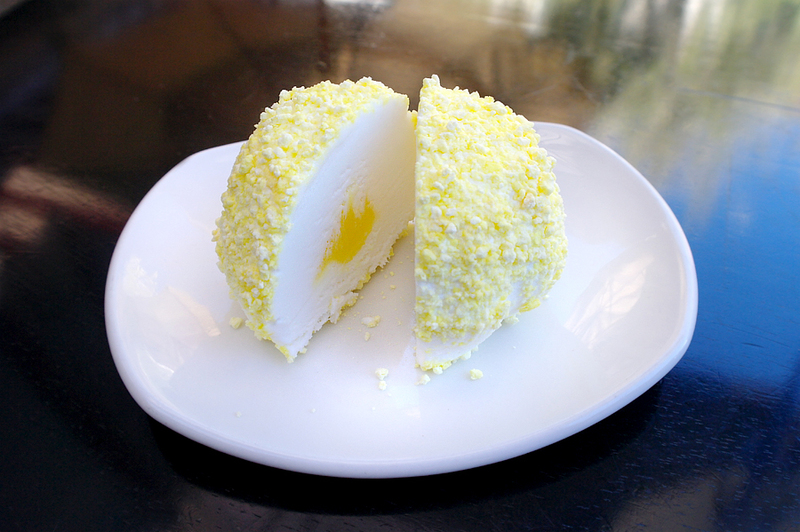 Lastly, we refreshed and cleansed our palettes with an incredibly light and beautifully presented Lemon Tartufo. It is an Italian ice-cream dessert which originates from Calabria, southern Italy. Typically, it’s composed of flavoured ice cream often with a frozen fruit or fruit syrup in the center. I can confidently add that I could polish this entire dessert myself — however, we split it. The crunchy shell added to the perfect amount of sweet for a light and icy cool treat. If you visit la Balena, be prepared to make a reservation and truly experience an authentic Florentine style meal, complete with a memorable culinary adventure with your loved ones. 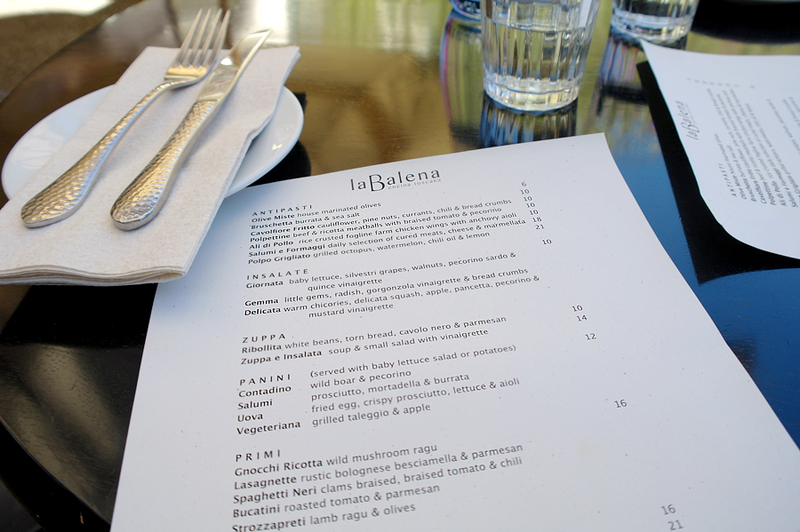 Our meal was hosted by la Balena, however the opinions in the blog post are 100% my own. These food pictures are incredible…can I please have that frittata right now?! B @ The Sequin Notebook recently posted..Holiday Card Swap Sign-Ups! This was a reaaaallly bad post to read before eating lunch. :) That frittata looks AHMAZING! That place looks so cute, and the dessert is dreamy! That is just my type of restaurant. I would love to eat there. All of the food looks so delicious and flavourful!! The frittata looks and sounds yummy (I looooove Pecorino and Pecorino Romano cheeses!). What a gorgeous restaurant. I love the grounds, and the food looks marvelous. Those pictures are making me hungry.. i would really like to go there, see the sites, and eat! I love Carmel too, and the food looks amazing. I will definitely try this place next time we go. Oh my goodness, what a feast! Everything looked positively remarkable and what an ending with that delicious dessert! Everything looks so amazing and I’m SO HUNGRY right now! How do you manage to eat all of that food and not leave in a food coma?! ;) DELICIOUS! Awesome, I want to go! Great pics! Oh my. You look like you had a great meal. Thanks for sharing the amazing photographs. The food looks delicious. If i am ever in the area i will try it for sure. 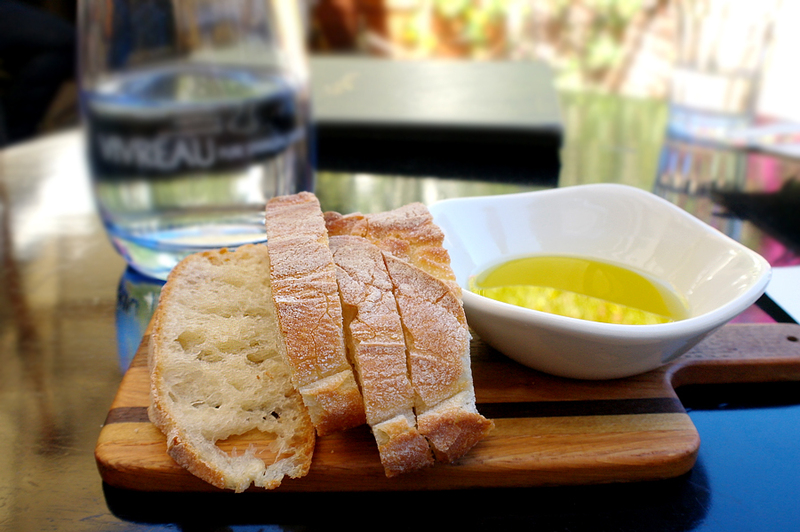 Fresh bread and olive oil is my favorite. I could eat just that for dinner, or lunch, or breakfast…. I get to Carmel a couple times a year so I am definitely going to try this one out! I have NEVER seen any form of fried chicken at any Italian restaurant or in Italy, I am FASCINATED because it looks amazing! oh nancy next time your post will come with samples right? =) everthing looks delish!!! ananda recently posted..Paint a Galaxy in 30 Minutes! The bread looked delicious and I think I’d be full eating just that for brunch. :P The lasagnette with those feisty colors and layers is a winner! Wish I can visit Carmel, too, in the future. Perfect for weekend dates. I would love it here. The food looks delightful! Makes me hungry! This place looks awesome! Whoa the food looks amazing! Those frittatas can vanish when I touch them. Looking delicious. Bread dipped in oils and vinegars is so simple but one of the best things to eat eveeeer. I am jelly of your delish meal! Chelsea recently posted..Mixing Patterns + GOOD NEWS! @Chelsea: Even I’m jealous of the meal I had. HAHA. I want to go back! Wow it looks wonderful! I love reading about all these great places! Great photos! I’d love to see Carmel too. Oh man, that looks so yummy! I lived in Italy for a while and am usually quite critical of Italian food. But this looks worth a try. @Michelle Snow: It was all so amazing. i love this!!! 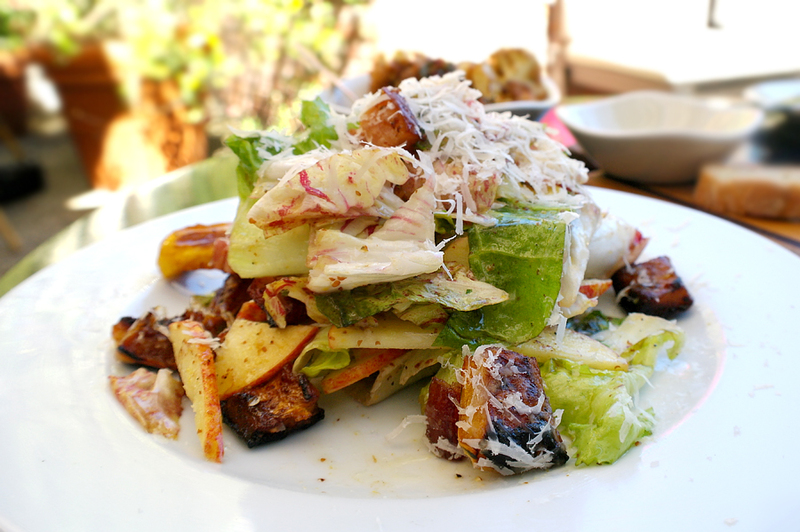 adding this to the list for when we return to carmel next — YUM! great review!! Yummy food and captured so well! A good pictures always tempts me for the food. Seems like such a wonderful place but the food looks really yummy! Oh my gosh that all looks so delicious! ….And now i’m terribly hungry! ;) Looks like a great trip thus far! What a yummy looking meal, great photos. 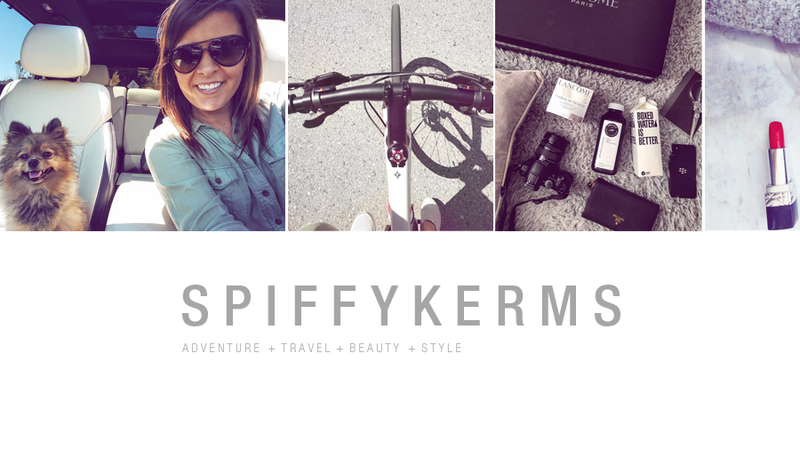 You take amazing photos! I usually don’t like food posts, but I am interested in going to Carmel and found this. That restaurant is adorable. I would love to have tea there. What a beautiful restaurant. That’s definite date night dining material! Looks like an amazing place indeed. It is just gorgeous and the food looks so delicious. All of the food looks mouth watering indeed. I would love to go there some day. Thanks for sharing. Carmel state beach is one of our favs. So charming! So this post pretty much ruined any chance of me continuing a diet. Everything looks so delicious! This all looks so delicious! I love that he gave you his history and the history of the restaurant. Bonus that they keep everything so fresh and seasonal! I guess you didn’t have the octopus in the end? You should really try it, it’s surprisingly meaty and delicious! Ok, now i’m HUNGRY! The food pix are fab! Dawn @ Pin-n-Tell recently posted..#FallRoundUP: 40+ Perfect Pumpkin Recipes! What a lovely restaurant. 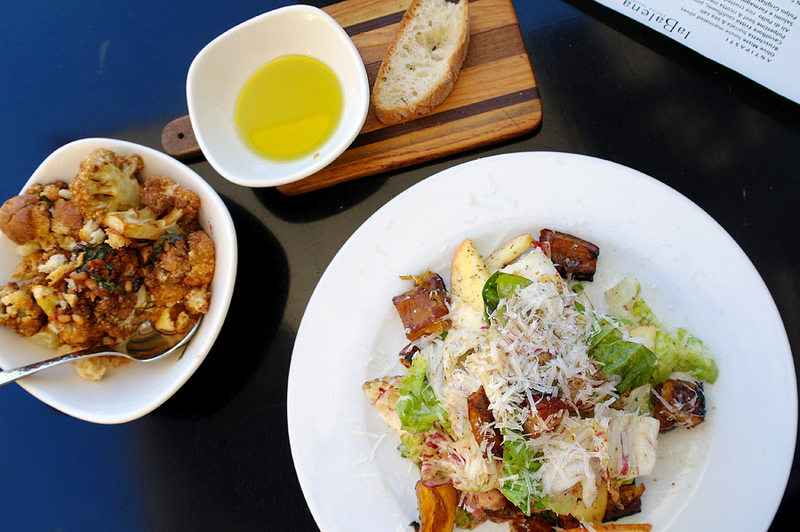 Everything looks so good especially the Delicata salad. la Balena looks wonderful! All of that food looks delicious. Everything looked extremely good! But most of all that lemon sweet treat to finish off the night. To die for! It just looks like heaven in my mouth! All of the food looks amazing! I’m not even sure what I would choose to eat first! 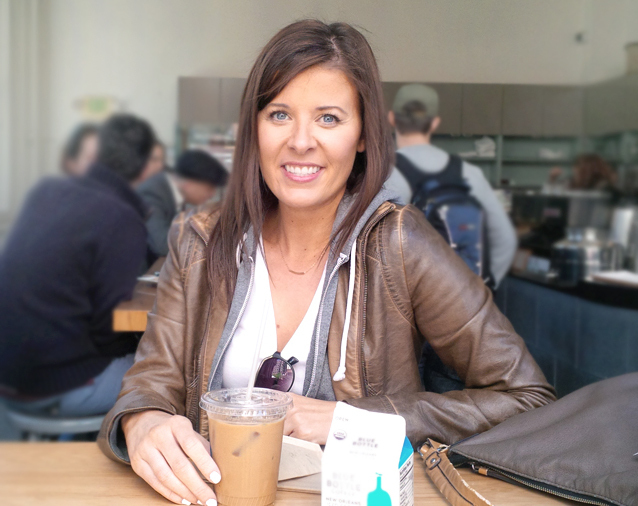 Carmel is one of my favorite cities! I didn’t get to read all parts of this post right away as I was mesmerized by the food pics. Jeez….that looks AMAZING.